Yep, this is the third zoodle recipe I’ve posted in less than 2 weeks. What can I say, I love zoodles! 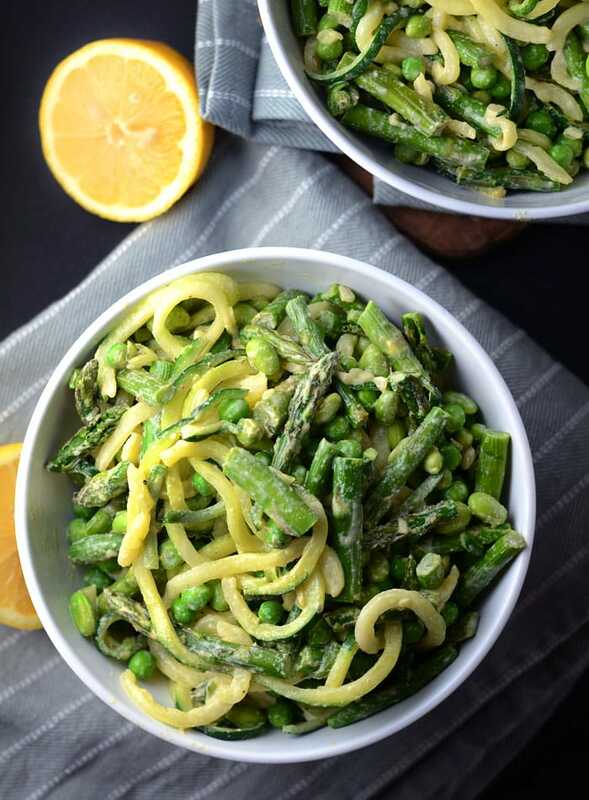 Or rather, I love pasta..lol, but I don’t really love how it makes me feel but zoodles are close enough and this Creamy Roasted Asparagus and Zoodle Pasta Salad is just da. bomb….diggity-bomb. While I’m in macro-land right now, oodles of zoodles are life and no complaints because I love eating all the plants I can get my hands on! I’ve really been loving peas and edamame lately too, so in they went. I’m also a big fan of all things asparagus and love all the vitamins and minerals it provides, so in it went too! Dressing-wise, we’ve got tahini (big time vegan staple – grab some on Amazon), nutritional yeast (my favourite – get some here! 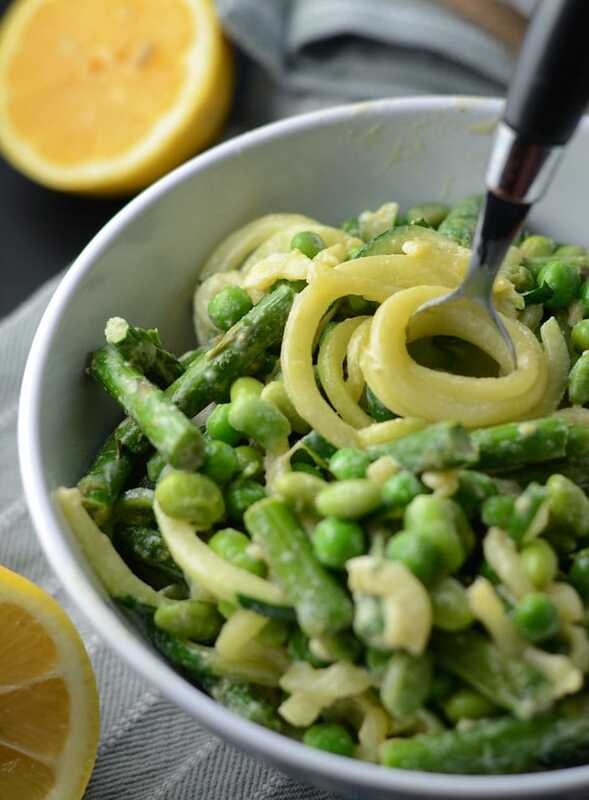 ), garlic, lemon and apple cider vinegar for an extra tangy and fresh as can be creamy finish to this healthy pasta salad. Best part of this creamy, tangy salad is…17 grams of plant-based protein per delicous serving! 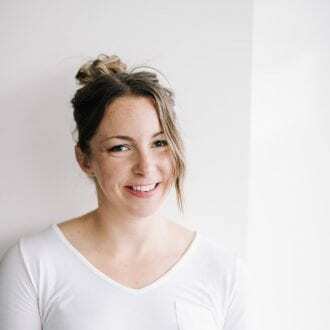 Plant protein winner right here! All that goodness for only 205 calories with 21 grams of carbs and 7 grams of fat too! Plus it’s so yummy, you won’t even miss the real pasta! It’s full of flavour, has great texture and a creamy, healthy dressing made with wholesome ingredients. You can really dig into this dish and if you’re extra hungry feel free to go for a double-serving without blinking an eye. MMMMMM. 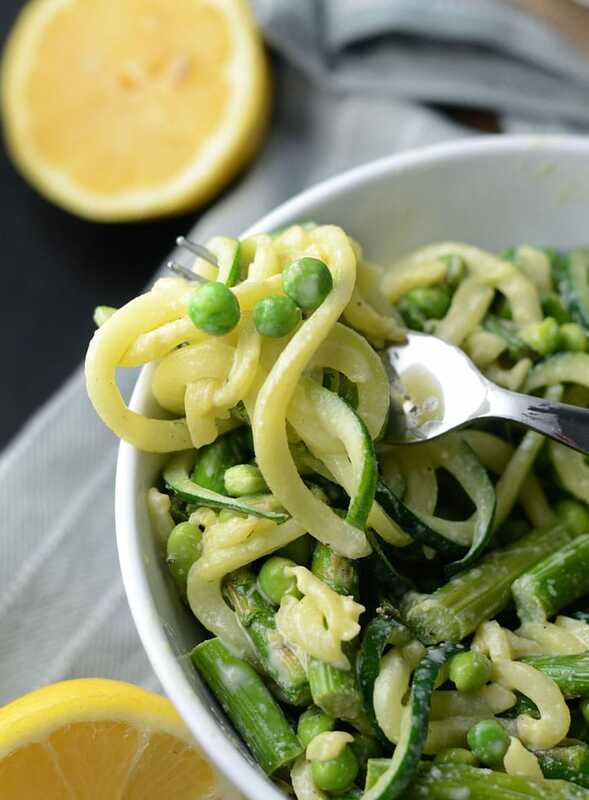 Treat ‘yo self to a spiralizer and get zoodling!! 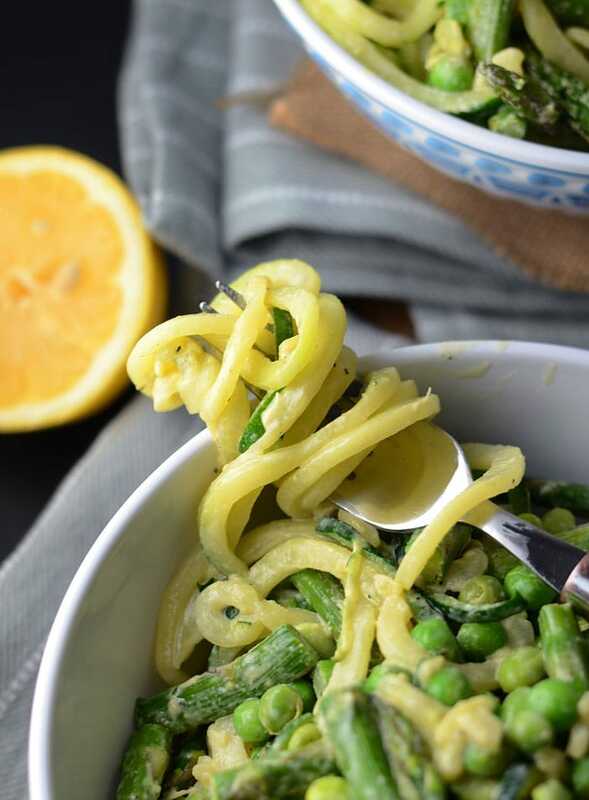 This healthy version of pasta salad is made with zucchini noodles and a tahini dressing. It’s low in fat and carbs but packs 17 grams of plant-based protein per serving. It’s oil-free, vegan and gluten-free but still packed with tangy flavour and plenty of nutrition. While the zucchini is “sweating”, add the asparagus pieces to a roasting pan, sprinkle with salt and pepper and roast at 400 degrees for 12 minutes. After 10 minutes, lift the zoodles out of the colander and place in a dishtowel, wrapping them up to to form a ball. Twist and squeeze to remove any excess water. 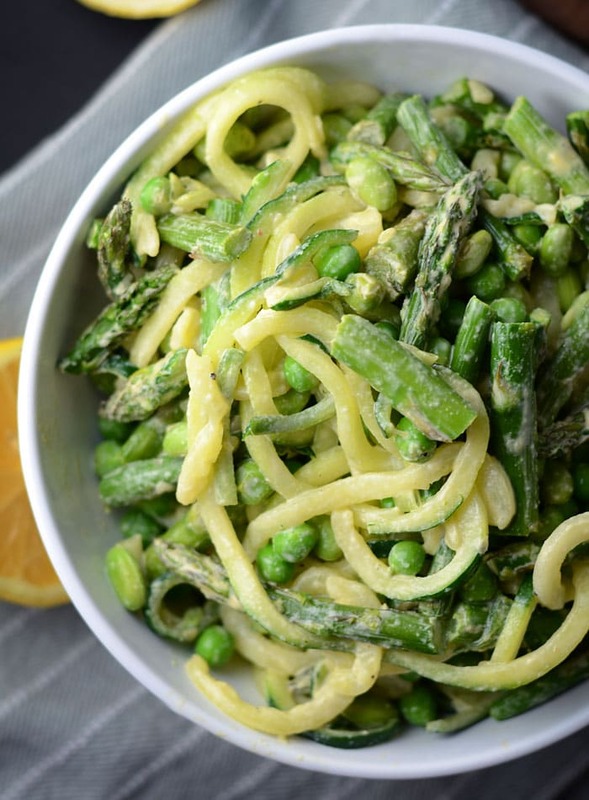 Add to a bowl with the green peas, edamame and roasted asparagus. Place the dressing ingredients in a blender and mix until smooth and creamy. If needed add a little water in order to blend but not too much, the dressing should be quite thick. Add the dressing to the rest of the ingredients and mix to combine. Top with fresh cracked black pepper and serve. 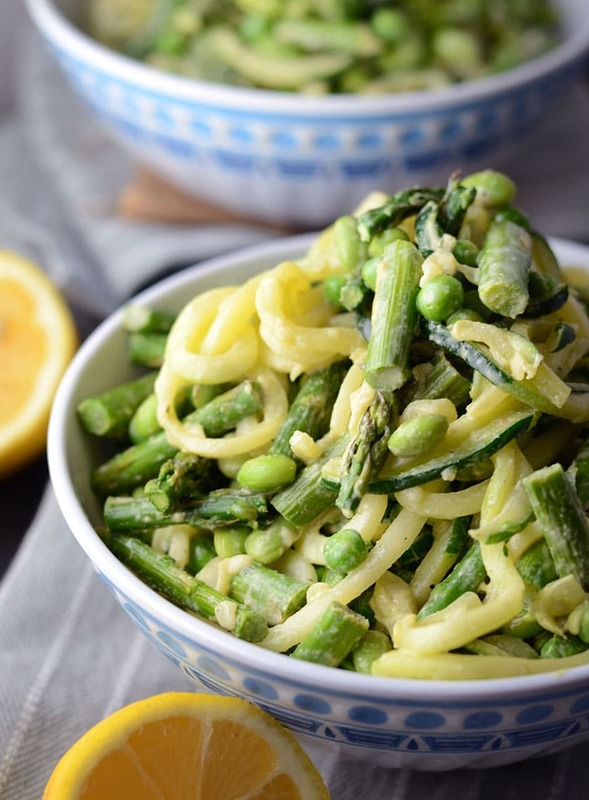 All the green veggies — this screams spring! You can never go wrong with tahini in terms of creaminess! I love the nutty flavor it will lend to the zoodles and asparagus! Don’t you cook the zuke noodles? I eat them raw a lot of the time, so in this recipe they are not cooked. If you prefer, you can cook them in a pan before mixing with the rest of the ingredients.